We all have a bin full of disposable gadgets, stuff that seem valuable but we’ll never use again, like a wired computer mouse, a keyboard with missing keys, and a bunch of cords that hook up to who knows what. Most likely than not, these bins also contain more than a few tangled Apple EarPods, the recognizably white earphones that come standard with every iPhone and iPod. Even though the EarPods cost $30, they’re not what we would call state-of-the-art. But before you toss them in the garbage, you might want to listen again using the new BoomStick audio adapter. BoomStick uses proprietary algorithms to enhance the sound that comes out of any pair of headphones with the standard 3.5mm plug. Using the Apple EarPods, I could definitely hear the difference. By plugging your earphones into the BoomStick and then plugging the BoomStick into your smartphone audio jack, this tiny gadget instantly boosts the sound, making it louder while enriching the bass and acoustic levels. The BoomStick comes in black or silver and can be pre-ordered fromBoomCloud360.com for $99. Pre-orders will be shipped out in February, and the BoomStick will be available on Amazon.com and other retailers in the Spring. This portable adapter is easy-to-use with just an on-switch and one button. Tap the button to activate it and hear the difference. Press down on the button to enable “Boost” mode for when you’re on an airplane or any other particularly noisy environment. The rechargeable battery lasts for 14 hours, and it won’t drain your smartphone. Even though the BoomStick only weighs an ounce, you’ll still be able to feel it hanging from your smartphone while walking around town. While Jay-Z (Tidal) and Neil Young (Pono) are advocating for audio fidelity via lossless compression, the BoomStick uses an ingenious approach to improving sound quality. And unlike lossless compression, you can actually hear the difference. The device uses proprietary algorithms to decide which parts of a song it should amplify by tapping into psychoacoustic bass enhancements, sound-field expansion, and high frequency contouring to bring out definition, clarity, and detail in song instrumentation. These algorithms also work to augment the sound in movies, too. 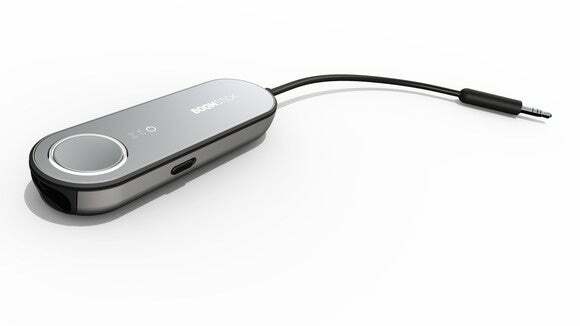 Even though the BoomStick makes your earphones sound louder, the company claims that it does not affect safe volume levels. The sound level is turned up only slightly when the BoomStick is activated, not enough to cause hearing damage. Instead of incorporating the technology in a new line of headphones, the BoomStick team chose to create an accessory that could work with any and all pairs of headphones you already own. The team also considered implementing these software algorithms into an app, but Apple restricts tinkering with iOS internal sound processing. 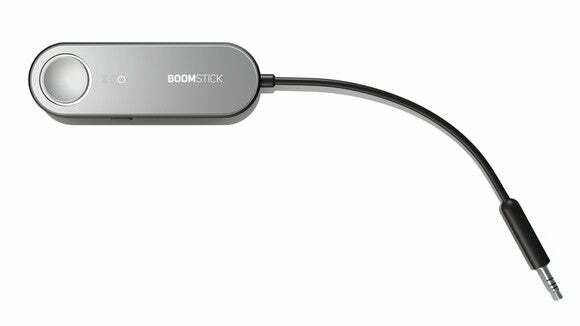 According to an independent consumer survey, 92 percent of listeners agreed that the BoomStick improved the sound quality of their headphones, whether they were Apple EarPods, Beats, Skullcandy, or Bose. The survey also claims that the BoomStick made the Apple EarPods and Samsung earphones sound better than premium headphones from Beats and Bose. But that’s misleading because the respondents only tested the BoomStick with their own devices and were never asked to cross-reference cheap earphones with expensive headphones. There’s an inherent difference between someone who listens to music via the free earphones that came with their smartphone and someone who invested hundreds of dollars in high-end headphones. There are different expectations when it comes to something “sounding good.” Furthermore, the headphone design delivers better comfort and acoustics, so comparing them with earphones is an apples-and-oranges situation. Even though the BoomStick doesn’t quiet make your cheap earphones sound as good as expensive headphones, the gadget does improve sound quality. In fact, the survey found that the BoomStick attached to Beats headphones provided the best audio quality. So whether you’re an audiophile who already invested in premium headphones or just a casual listener forced to buy cheap earphones at the airport, the BoomStick will certainly make an audible difference.